Read the following quote carefully and ponder for a minute about what you understand from it. 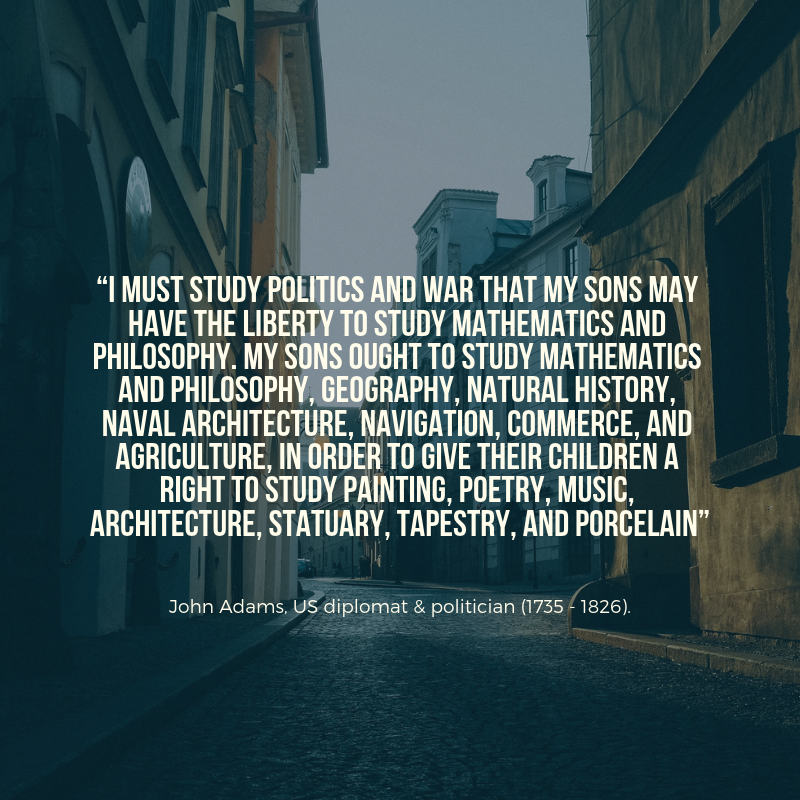 “I must study politics and war that my sons may have the liberty to study mathematics and philosophy. My sons ought to study mathematics and philosophy, geography, natural history, naval architecture, navigation, commerce, and agriculture, in order to give their children a right to study painting, poetry, music, architecture, statuary, tapestry, and porcelain,”John Adams, US diplomat & politician (1735 – 1826). So, what did you interpret by what US diplomat & politician, John Adams had to say? What I understood was that art is something that is clean, honest and makes us feel divine and if it was not about survival, wars, money or materialistic things we would be spending more time exploring it. Now, you might be a scientist or an analyst or a doctor, where do you find yourself when looking to enjoy your free time? Is it listening to music on your headphones? Is it going out for a movie with your family? Is it reading that fiction novel? The point I am trying to make here is that art is something that makes us feel human and that is something we are really missing in this century. Also, a lack of money for the talented but middle-class artist and lack of awareness is killing it. People need to show their trust in crowdfunding platforms like PledgeMusic and other such that are struggling with the same. But hey, here is some good news for this art form. Wefuture, a UK-based startup that operates a crowdfunding platform and ‘music interaction network’ called Show4me, says it has closed a $12.8 million funding round, with the investment coming from an unnamed UK-based corporate investor. As per Show4me’s founder, Karėn Chiftalaryan, the latest funding round is the platform’s third having attracted $13.5m total investment so far. Show4me is a platform designed to ‘help musicians and music industry players manage their music business activities on a single specialized network, grow their fan base and engage them through unique direct-interaction model’. The company claims that over 5,000 musicians and music business execs are registered on the network prior to its official launch. This is what Karen had to say on the latest funding raised. Now, will you back a budding artist? I hope you do.